Title: Epicedium, a funerall song, vpon the vertuous life, and godly death, of the right vvorshipfull the Lady Helen Branch. Epicedium, a funerall song, vpon the vertuous life, and godly death, of the right vvorshipfull the Lady Helen Branch. London : Printed by Thomas Creede, 1594. 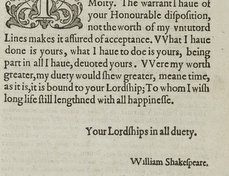 Epicedium, a brief quarto pamphlet made up of only a single poem in memory of Lady Helen Branch, contains one of the earliest allusions to Shakespeare’s Lucrece by name. Lady Branch, the widow of Sir John Branch, who had served as Lord Mayor of London in 1580, died on April 10, 1594. This is one of four poetic tributes to her published shortly after her death. As noble Pompeys most renoumed wife. The first poet, of course, is likely Shakespeare, whose popular Lucrece was first published in 1594. The speaker suggests that the real women of England, like Lady Branch, would be richer subjects for poetry and are unfairly neglected by poets who write about classical figures. The second poet is probably Robert Garnier, whose tragedy Cornelia had been published in two separate issues in 1594. Epicedium includes an attribution to “W. 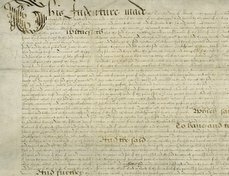 Har” on its last page, but the poem is generally attributed to the naval officer William Hervey, Baron of Kidbrooke and later Ross (sometimes proposed as a candidate for the “Mr. 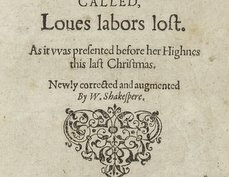 W.H.” of Shakespeare’s sonnets). 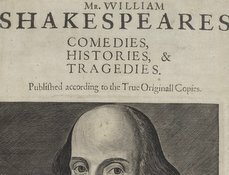 Two copies are known to survive: one at the British Library and one at the Folger Shakespeare Library. Mr. Folger purchased this volume in March 1927. S. P., An Epitaph of the Vertuous Life and Death of the Right Worshipfull Ladie, Dame Helen Branch of London (London: T. Creede, 1594): STC 19078.4. John Philips, A Commemoration of the Life and Death of the Right Worshipfull and Vertuous Ladie; Dame Helen Branch (London: J. Danter, 1594): STC 19863.7. Joshua Sylvester, Monodia (London: P. Short, ): STC 23579. F.J. Furnivall, C.M. Ingleby, and L. Toulmin Smith, comps, The Shakspere Allusion-Book: A Collection of Allusions to Shakspere from 1591 to 1700, ed. John Munro (London: Oxford University Press, 1932): 1:14.